Dr. Vishakha Kapoor is a consultant ophthamologist and practices at Medanta in Gurgaon (Gurugram). She is a leading expert in diseases of eye in the country who provides OPD at Medanta in Gurgaon (Gurugram). Dr. Vishakha Kapoor has a vast experience in dealing with refractive surgery, cataract surgery, Femto-LASIK, glaucoma etc. at Medanta in Gurgaon. Dr. Vishakha Kapoor is well versed in treating eye pain, blindness, colour blindness, night blindness, cataract, glaucoma (increased pressure inside the eye ball), myopia (short-sightedness), hypermetropia (long-sightedness), astigmatism, squint, conjunctivitis, corneal ulcer, corneal opacities, retinoblastoma (childhood retinal cancer), orbital blow-out or orbital fracture, fungal infection of the eye-lids, neuromyelitis optics (inflammation and erosion of the optic nerve), nystagmus (rapid, uncontrollable and oscillatory movements of eyes) , exophthalmos (protruding eye-balls), bhlepharospasm (spasm of the eye lids), amblyopia, ametropia, chalazion (cysts of the eye lids due to blockage of eye lids), hamarlopia (day blindness), diabetic retinopathy, hypertensive retinopathy, retinitis (inflammation of the retina), iridocyclitis (inflammation of the iris), dacrocystitis (inflammation of the lacrimal gland) etc. at Medanta in Gurgaon. Dr. Vishakha Kapoor has completed her MBBS from BJ Medical College in 1997, Diploma (Ophthalmology) from BJ Medical College in 2000, MS (Ophthalmology) from M&J Institute of Ophthalmology in 2001 and DNB (Ophthalmology) from National Board of Examination in 2002 to be an ophthalmologist. 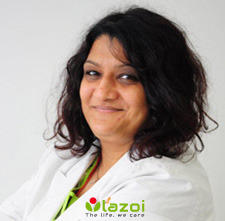 You can book an online appointment with Dr. Vishakha Kapoor on www.Lazoi.com.